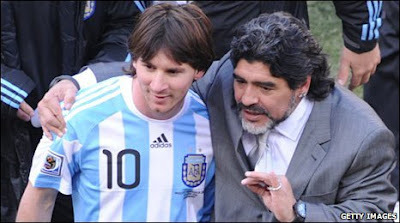 Maradona has also made it clear that Messi has a free role. He said: "Nobody ever told me where to play. So, I shouldn't have to tell Messi where to play either. It's up to him to decide where to play. He's a grown-up. I did it back in my era - and now it's his turn." Ghana striker Asamoah Gyan needed an ice pack after hurting his ankle in training on Monday but officials expect him to recover in time for Friday's quarter-final against Uruguay. Black Stars defender Hans Sarpei is also reportedly carrying a leg injury. Meanwhile, Ghana midfielder Kevin-Prince Boateng has revealed Italian side Lazio are interested in signing him from Portsmouth. He stated: "Lazio want me. I know about their interest but I don't want to think about it. For now, I just want to do well in South Africa." Uruguay coach Oscar Tabarez, whose side have impressed so far and beat South Korea in the second round, believes he is reaping the benefit of the majority of his players plying their trade overseas. He said: "Most of the squad joined the national squad when they were still playing in Uruguay at around 22 years of age. Four years later, almost all of them are playing at important clubs overseas and they are capitalising on that experience of playing high-level football abroad." Guus Hiddink thinks Sepp Blatter should only continue as Fifa president if he is prepared to allow the introduction of goal-line technology and video replays in order to avoid future controversies. The former Netherlands boss, now in charge of Turkey's national side, stated: "Sepp Blatter should announce tomorrow that video replays will be implemented, or he needs to resign." Fit-again Netherlands winger Arjen Robben does not believe he is back to his best yet, despite returning to the starting line-up with a man-of-the-match performance in the 2-1 victory against Slovakia. Robben, who had been out with a calf injury, said: "It was a great feeling to start the game. I am not yet at my top level but I was pretty confident."